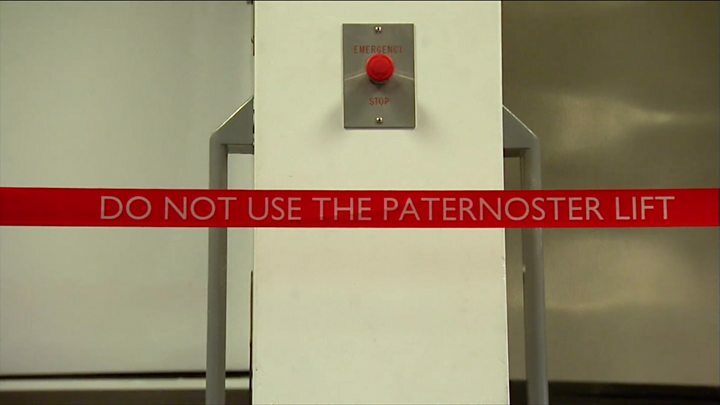 A rare Paternoster lift - which has no doors and moves continually without stopping at floor level - is to be removed by a university. Installed in the Attenborough Tower of the University of Leicester in the late 1960s, the lift was one of the last in the UK. While acknowledging the device will be missed, officials said it had become too expensive to maintain. A replacement standard lift is due to be installed by September 2018. A petition to save the lift, which has attracted more than 2,000 signatures, described it as a "fundamental part" of Attenborough Tower, and a "piece of engineering history". What is a Paternoster lift? Invented in the 1860s by Peter Ellis, an architect from Liverpool. Uses open compartments on a continuously moving loop, one side going up, the other down. Name comes from system's resemblance to rosary prayer beads and Latin for ''Our Father', which begins the Lord's Prayer. Other surviving UK examples are in the University of Sheffield Arts Tower and University of Essex Albert Sloman library. The University confirmed the news "with a heavy heart". In a statement it said: "We have done our best to maintain and update the lift, but unfortunately it has reached the end of its working life. "We've looked at a range of options and thought carefully about this, but it would be both impractical and uneconomic to attempt to fix it or replace it. "Spare parts for Paternosters are no longer available and need to be manufactured each time they are needed." Before it closed Professor Gordon Campbell, from the University, said: "There are loads of safety features, there is a cord to pull, a button to press and you can also bang on the sides. "Although it looks deeply dangerous, it isn't - and of course it moves at a very sedate pace."